With the release of Out Of The Box the band will deliver on the huge anticipation they’ve cultivated not just by their dynamic live show, but also their rapidly expanding online presence. The first single, “Face The Music,” cracked the Top 40 on Billboard Active Rock, with a video that has garnered over 100,000 YouTube views. While most bands in the genre push hard on a straightforward 4/4 beat, Silvertung incorporates everything from a swing feel in “Face The Music” to a change of time signatures from 4 to 3 in “Devil’s Advocate.” It creates an abundance of textures and layers, always keeping the listener on their toes. Like a bird of prey, “Devil’s Advocate” is a killer soaring high. The video is a captivating performance piece that showcases the energy and exemplary chops of Silvertung. Director David Snowden takes care to give each member ample screen time, but it’s the wider angle shots with the full band that truly captures the uniform assault to the senses that Silvertung brings to the table. A well placed letterbox, top notch color grading, and carefully selected visual effects turn this performance piece into a truly cinematic effort. We’re super psyched to be working with Pavement Entertainment to bring you this powerful piece of melodic metal! We would love to help get you whatever you need to include this video in your programming, so please let us know. Contact Andy Gesner and the HIP Video Promo staff at (732)-613-1779 or email info@HIPVideoPromo.com. 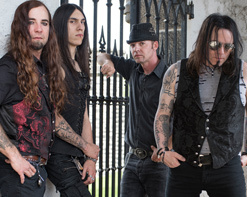 You can also visit www.Silvertung.com or www.PavementMusic.com for more info on Silvertung.